Here’s the latest on the new menu at Be Our Guest – plus the all the updates on news, weather, and closings this week at WDW. Be Our Guest has released a new menu. Image Courtesy of Disney Parks Blog. Be Our Guest Restaurant at Magic Kingdom has finally rolled out its new signature dining menu. Dinner is now a prix fixe menu, which means you pay per person for the meal and are able to select an appetizer, an entrée, and you receive a dessert trio at the end. Appetizer choices include Escargot, French Onion Soup, Maine Lobster Bisque, Charred Octopus, an Artisanal Cheese plate or a salad. Entrees include Center-Cut Filet Mignon, Smoked Ricotta and Corn Tortellini, Spice-Dusted Lamb Chops, Poulet Rouge Chicken, Saffron-Incused Seafood Bouillabaisse, or Roasted Pork Tenderloin. 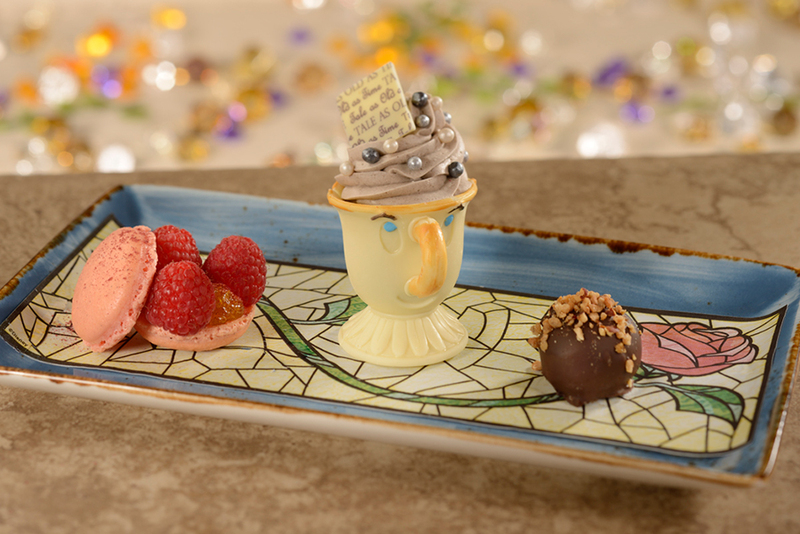 The Dessert Trio is an Almond Macaron with Lemon Jam and Raspberries, White Chocolate “Chip” Cup (served in an edible “Chip”, the cute boy-tea cup from Beauty and the Beast), and Dark Chocolate Truffle. Kids age 9 and below have a choice of Iceberg Wedge Salad or Fruit and Cheese Plate for an appetizer and Pan-Seared Chicken Breast, Seared Shrimp Skewer, Grilled Beef Tenderloin, or a House-made Macaroni & Cheese for an entrée. Kids dessert choices consist of either Seasonal Fruit or a modified Dessert Trio. With the kids Trio, they get to paint the “Chip” cup with edible paint! The cost is $55 per person ages 10 and up, $35 per person ages 9 and under, and if you are using the Disney Dining Plan, you will need 2 Table Service credits per person. New Cast Member costumes are coming to Animal Kingdom. Image Courtesy of Disney Parks Blog. Cast Members at Disney’s Animal Kingdom have received colorful new costumes in celebration of the parks 20th anniversary. A lot of thought went into the redesign, and many costumes include references to endangered species throughout the world. Disney’s Animal Kingdom has been a wonderful contributor to conservation and research and they continue to bring awareness to their efforts through costumes and stories. Chicken Guy lands in Disney Springs next month. Image Courtesy of Disney Parks Blog. A brand-new Quick Service restaurant is coming to Disney Springs! Chicken Guy, created by Guy Fieri, will be a chicken lovers paradise and will feature one-of-a-kind chicken tenders along with a variety of house-made sauces. There will even be a smoked bacon, lettuce, avocado, tomato, and creamy buttermilk ranch chicken sandwich. Doesn’t that sound mouth-watering delicious? If you’re more of a “sides” person there will be fancy mac ‘n’ cheese as well as loaded fries. Just make sure you save room for hand-spun soft-serve ice cream! This flavorful Quick Service restaurant will open sometime in August next to Planet Hollywood. Mark Walsh makes an appearance at H20 Glow Nights. Image Courtesy of Disney Parks Blog. You never know who you will run into at the Disney parks! Recently Pixar Animation Studios director Mark Walsh partied the night away at Disney H2O Glow Nights at Disney’s Typhoon Lagoon Water Park. You may not know Mark’s name, but you are probably familiar with his work. He directed the short film “Partysaurus Rex” and worked as an animator on “Finding Nemo” and “Toy Story 2,” among others. New entertainment at Ragland Road. Image Courtesy of Disney Parks Blog. Raglan Road is probably one of the most fun places to eat in Disney Springs and their entertainment is top-notch. They recently “plussed” the experience there by debuting Rhythms of Raglan 2018, and will combine amazing Irish dance routines, video effects, and expressive music for a memorable performance. There will be four shows throughout the evening featuring 16 musicians and 8 talented dancers. Raglan Road is one of the best entertainment venues in Disney Springs, and there is no cover charge to enter.